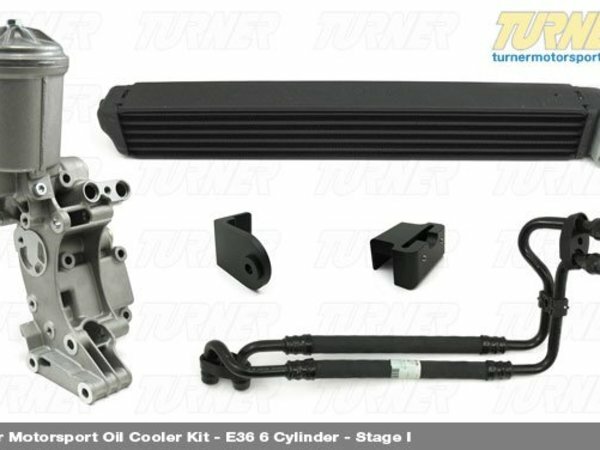 Our Stage 1 oil cooler kit uses mostly factory BMW parts to achieve a clean appearance and hassle-free installation, and works on ALL US spec 6 cylinder E36 BMW, including M3, 325i, 325is, 328i, 328is, and 323is (sedan, coupe and convertible). Everything we send you bolts or clips into place with no modification necessary and all hardware is included, making this an ideal kit for a street/track car. We use the system from the Euro E36 M3 so all parts are guaranteed to fit and look as it would had the car left the factory with it installed. Parts included are: Original BMW oil cooler (from Euro E36 M3), BMW oil cooler lines (rubber lines with metal fittings), a BMW oil filter housing (properly modified to accept the US banjo-style fitting of the VAN0S oil line), and brackets to mount the cooler to the bottom of the stock radiator. 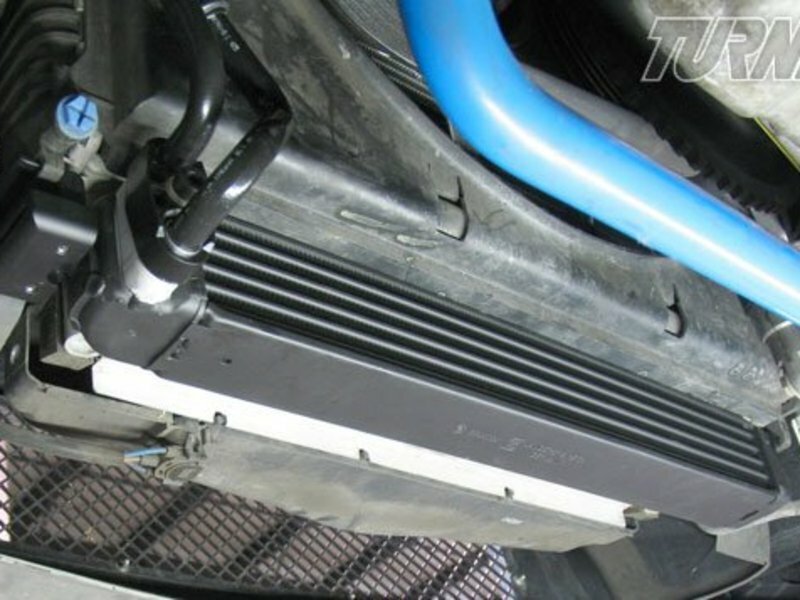 This oil cooler system incorporates the Euro M3 oil filter housing. This Euro filter housing has ports for the delivery and return lines of the oil cooler. The internal pathways of the filter housing are designed for the oil to flow out of the housing, into the cooler, and then back to the housing to pass through the filter. Also the Euro housing has an integrated thermostat to bypass the cooler at lower temps (who needs cold oil when the engine is cold?). The US housing is not setup for any of this as the oil just runs straight into the filter and onto the engine. Using this housing also allows the use of the factory euro oil cooler lines, and is a direct fit with a minor modification that we make in-house. Other kits that are on the market don�t have this modification or have a �quick fix� solution which can open up the possibility of leaks or oil starvation. We don�t take shortcuts so our products are engineered to work as a complete system � no leaks, no fitment problems, and superior performance. This kit will not work on cars with a super charger or racing alternator pulley due to clearance issues with the oil lines. This kit WILL work fine with our TMS pulley kits. For cars with forced induction, turbo, supercharger, or racing alternator pulleys, we recommend our Stage II or Stage III kits, which provide more flexible/universal routing of oil cooler lines, as well as larger oil cooler (Stage III). This oil cooler system incorporates the Euro M3 oil filter housing. This Euro filter housing has ports for the delivery and return lines of the oil cooler. The internal pathways of the filter housing are designed for the oil to flow out of the housing, into the cooler, and then back to the housing to pass through the filter. Also the Euro housing has an integrated thermostat to bypass the cooler at lower temps (who needs cold oil when the engine is cold?). The US housing is not setup for any of this as the oil just runs straight into the filter and onto the engine. Using this housing also allows the use of the factory euro oil cooler lines, and is a direct fit with a minor modification that we make in-house. Other kits that are on the market dont have this modification or have a quick fix solution which can open up the possibility of leaks or oil starvation. We dont take shortcuts so our products are engineered to work as a complete system  no leaks, no fitment problems, and superior performance.